Dog lovers miss their dog(s) whenever they have to leave their pets at home, be it for work, vacation or simply to run errands. Hearts seem to break when “good byes” or “see you later” must be said, but those broken hearts mend once again when the pet owners return home. The pet owner in this video was doing a three-month long medical practice in Lisbon, here she is reuniting with her four-legged best friend. You would know what true love actually means if you had ever been loved by a dog. How pure and unconditional their love is! They don’t care about your looks, social standing, or the money you make—they are concerned only about you. Can you imagine what mental agony these loving creatures go through when their human companions go away for long? Or their joy when they get reunited? These dogs jump with joy when they meet their human mamma after a long time! They lick their mommy’s face and roll on the floor with her! 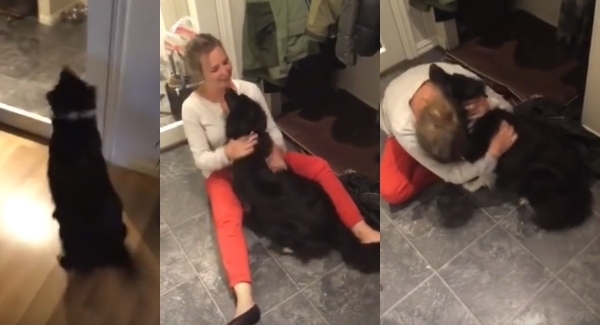 Responses to "Dog Welcomes Owner Home After Three Months Apart"